Custom Woodworking and Design LLC. is owned and operated by John Franzino. We specialize in high end custom kitchens, baths, wall units, furniture and bars. We are a small shop in West Milford, NJ with close to 20 years of experience. We have no salesmen so you deal directly with John, the owner and builder of your cabinets. Because we are a small shop and not a factory with many employees, we pay special attention to the craftsmanship that needs to go into each and every cabinet. 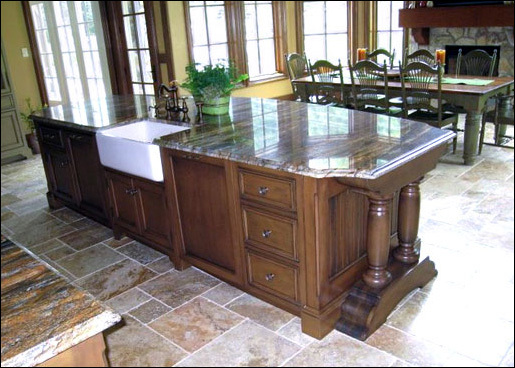 Our custom cabinets are built with the finest cabinet grade plywoods available. We do not use any MDF or particle board like stock cabinet companies do. The interiors of our custom cabinetry are prefinished with a very durable clear finish that will last the lifetime of the cabinet. Our custom cabinet doors are built in our shop to match and fit your cabinets perfectly. Our doors are made from the finest hardwoods available. Our drawers are always made with the finest hardwoods. We never use plywood. Dovetail construction is always used to provide strength and durability for the lifetime of your cabinets. Contact us to learn more about our high end custom kitchens, custom baths, custom wall units, and other work. We are happy to discuss what custom woodworking we can create for your home. Our shop is located in West Milford, NJ, in Passaic County. We are nearby Ringwood, Kinnelon, Wanaque, and Sussex County and Bergen County.